Alpine Glass recently had the pleasure of completing the supply and install of two bi-fold doors which left Mr. Hussain in Harrogate joyous with the result. The project meant that Mr Hussain could now benefit from a new open plan living style, extending the space in his home substantially. The customer knew he was in good hands when choosing Alpine, preferring the more personal customer service a small company has to offer. No question or request was too much – installation was fantastic and looks really good. They glide like we wanted, adding the finishing touches to our home! Thanks to Alpine Glass’ swift and smooth installation, Mr Hussain can now start to benefit from having a home that offers a more natural way of transitioning from house to garden. 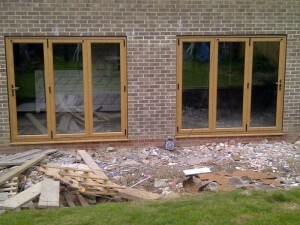 Both sets of his bi-folding doors create the impression of a more spacious rear of the house. The bi-folding doors themselves feature especially slim sightlines to ensure that Mr Hussain benefits from panoramic views of his garden all year round, even when they remain closed. Being able to choose from a whole range of panel configurations assured that Mr Hussain always remained right on track, much like his new doors. Thanks to Alpine’s wildly popular wood-effect uPVC colouring and complimentary golden door handles, Mr Hussain’s property was able to retain a sophisticated look whilst never compromising on function or ease of use. Bi-folding doors installed by Alpine create large apertures which, when opened, fold across into each other in a leafing fashion to seamlessly join the inside and outside of any property. For Mr Hussain, it was important that both his sets of bi-folding doors could be operated easily, without the need to ever struggle. Alpine took this sentiment on board and took extra care to assure that the doors met these expectations, gliding flawlessly and effortlessly upon the track in which they were fitted. Our doors are extremely weather resistant and durable to prevent rusting, this factor meant that Mr Hussain would benefit from the ultimate levels of performance, time and time again. Mr Hussain rated Alpine Glass 10/10 with regards to the quality of the finish, customer service he received and the amount of information he was given throughout. He went so far as to say that the specific service supplied by Alpine was; “The best to date”, meaning he would recommend us to others every time. At Alpine, we always ensure that we keep you informed throughout any home improvement process you are undergoing, assuring that the job is always completed to your satisfaction and that your home is left in a clean and tidy condition. If you, like Mr Hussain, are interested in improving your home we can help. From replacement windows to conservatory extensions, no job is too big or too small for us to provide you with the same bespoke service. Contact us today! This entry was posted in Case study by Alpine Glass. Bookmark the permalink.